The recent news regarding TruGreen Lawn Care being spun off from its parent company ServiceMaster may have an impact for thousands of homeowners throughout Ohio. Service Masters decision announced with its third quarter earnings report, showed TruGreen’s financial performance has continued to decline over the last several years. While the announcement came as a surprise, the most intriguing part of the announcement is that it will happen by December 31, 2013. No specific reasons were provided, but most observers believe there may be more changes in the near future. How Might This Affect Trugreen Customers? 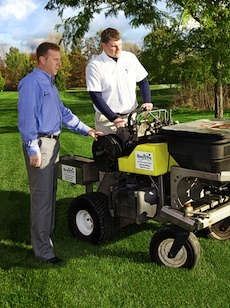 Considering TruGreen, based in Memphis, Tennessee, has many branches in Ohio and serves thousands of customers in the Buckeye State. While most lawn applications have concluded for this year as we enter the winter season, the questions remain what changes may occur over the next several months. Because of the seasonality of the business, Spring application do not begin until March, but like most lawn care companies, customers are offered pre-pay discounts for paying for services in advance. It’s quite possible this may have a serious impact on TruGreen’s ability to collect advanced cash in lieu of uncertainty. Moreover, it is possible that restructuring may occur and branches maybe relocated or merged to reduce overhead and this can have a huge impact on their ability to serve the customers. In full disclosure, I own a small lawn care company in Ohio, Weed Pro, and compete against TruGreen every day. Having been in business for 13 years and previously selling lawn care supplies to other lawn care companies, TruGreen has always been the largest lawn care company in the world so this news sent shock waves across our Industry. No matter your opinion of the service they provide, the sheer size and scale of an organization like TruGreen absorbing the challenge they now face is humbling for all business owners. The lessons we should all take from this news is to take stock in the values and service we offer our customers every day. Focus on meeting and exceeding customer’s expectations and the financials will take care of themselves.